Nothing can be more frustrating than turning on your lawn mower but it fails to start. You may have psyched yourself throughout the week only for your morale to be killed when about to lawn. Or maybe you promised your neighbor to mow the lawn. Usually, the engine fails to start due to a bad battery which is unable to keep a charge. And as you know, the best solution to a failing battery is to purchase a new unit. Forget, those simple fixes that promise to restore a bad battery. They either won’t work or will work briefly meaning you will still need to buy a battery. With all kinds of information and batteries in the market, finding a good one can be a challenge. 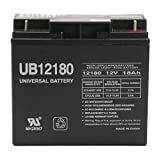 But after reading this review, not only will you know the best lawn mower batteries but also how to pick and maintain one. Besides a lawn mower, this lead acid battery will also power spotlights, backup systems, and other equipment. It has a good voltage and current for easy cranking. It comes in a sealed design to prevent excessive evaporation of the electrolyte which shortens the batteries lifespan. Additionally, this reduces spillage that contributes to corrosion. Additionally, the 12V battery is only 12 pounds and won’t exert too much strain on the equipment. It also takes up minimal space since it measures 7.13(L) x 3.01(W) x 6.57(H) inches. It’s based on the absorbed glass MAT (AGM) technology and is among the easiest to maintain. Running your lawn mower or tractor will be hassle-free if you rely on the ML35-12 SLA battery. The 12V DC battery delivers 35 Amperes per hour and should effectively run most mowers and tractors on the market. It is 7.68(L) x 5.16(W) x 7.13(H) inches and occupies little space in equipment. The sealed lead acid battery doesn’t leak or spill and is easy to maintain. What’s more, it keeps a charge for a considerable period and can handle both cold and hot temperatures as well. The rechargeable battery can be mounted in different positions without problems and is tolerant to vibrations, and shocks. This sealed lead acid battery is rated 12V DC and produces up to 20 amperes per hour. It is ideal for lawn mowers, tractors, power backups and other equipment. The unit is lighter than most units on the market and has a space-saving design. In addition, it is made from strong materials and has a rugged design to tolerate regular use, tough handling, vibrations, and impact. The Absorbed Glass Mat (AGM) technology makes it more tolerant to regular charging and discharging and also allows it to work within a wider range of temperature. Fitting the maintenance free battery is quick and easy. 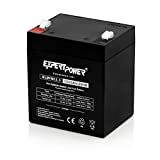 This genuine ExpertPower battery will effortlessly power most lawn tractors and mowers on the market. The 12V sealed lead acid battery produces 18 amperes per hour and is fit for the most everyday application. It is made of robust non-conductive ABS plastic to bear impact, shocks, vibration. And considering it is sealed, chances of leakage or spills are unlikely. Fitting the battery is simple and quick and you just need basic knowledge and tools. Once properly fitted, it will remain firm. It has a wide range of temperature to operate in different environments and is tolerant to chemical attack. With a weight of about 4 pounds, carrying the battery is easy and it also won’t put lots of pressure on the lawn mower. This battery is 3.54 long, 2.76 inches wide and 4.21 inches high. It has a 12V DC output and has an amperage of 5Ah. Furthermore, the sealed lead acid battery is suitable for lawn tractors, mowers, spotlights, UPS backup systems, exit lighting, and flashlights. The rugged design handles vibrations, impact, vibrations, and shock well while the wide temperature range suits it for different environments. Fitting it in the equipment is not only easy but also quick. 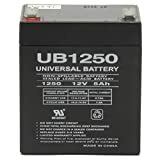 This battery from Universal Power Group is noted for its good performance, longevity, and durability. It powers different equipment including mowing tractors, lawn mowers, UPS backup, and garage door openers. The rechargeable battery provides 12V DC and 18AH and has a spill proof design to prevent leakage and also to prevent corrosion. Moreover, mounting the battery on different accessories is easy thanks to the simple and compact design. It’s built from a tough and rugged material to handle the vibrations, bangs, impact, shocks and normal discharge and charging. The AGM battery weighs about 11 lbs and measures 7.5(L) x 3.06 (W) x 6.60(H). 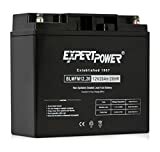 The ExpertPower EXP1250 delivers 12V DC to power lawn mowers and other related accessories including electric scooters, home alarms, UPS backup, garage door openers, and ion block rockers. It has an amperage rating of 5Ah and holds a charge for a good period. The unit will deliver good cranking power in both hot and cold environment and doesn’t leak or require topping up since it’s sealed. Also, the replacement battery has a rugged construction and will handle the bangs, knocks, shocks, and vibrations and impact well. It is also valve regulated for easy running and maintenance. It measures 3.5(L) x 2.8(W) x 4(H) inches for saving space and weighs about 3.3 Lbs. The sealed lead acid battery’s high performance makes it a top choice for most people. Modern materials appear similar and all seem to be made from plastic. However, many don’t know that the material varies from manufacturer to manufacture. Some are very sturdy and will bear the vibration, bangs, abrasion, the high operating temperature, and cold weather. Weaker plastic is prone to cracking, fading, warping or melting due to heat. Before purchasing a battery, you should first ensure it will fit in the battery compartment. A larger space can handle a bigger battery. Fitting an oversize battery in a small compartment will reduce the space and this may affect the airflow around it. It may also lead to high temperatures and also allow spills to reach other parts of the lawn mower causing corrosion or rusting. You should stick to the recommendation of the manufacturer or seek expert opinion if you want to fit a high capacity battery. Just like other people, I initially bought batteries without looking at the ease of maintenance. As long as it was the right size and within my budget, it was perfect. However, I killed my first battery because of not topping up with distilled water. The next one seemed to spill due to excessive evaporation. If you aren’t so hands-on or are forgetful, then you are better off with a sealed maintenance-free battery. The position, thickness, height, and design of the battery terminals vary from battery to battery even from the same manufacturer. A taller battery may be of the same size with a smaller one but may not fit in the compartment. The space between the positive and negative terminal may be a bit narrow and will be a bit of a squeeze on the wires. It’s also important to make sure the connectors match the terminal thickness. If you carefully look at a battery, you’ll see cold cranking amps (CCA) ratings. The higher the value, the more cranking cycles it offers. Understanding this is crucial since using a lowly rated battery or that with fewer CCA will affect the starting of the lawn mower especially in the cold climate. If you live in a hot environment, then it may not be very wise to pay a higher price for higher CCA rating. Also important is looking at the Voltage, Manufacturer, Consumer reviews, Amperage (Current), Weight, and Compatibility. A good battery will store charge for an extended period even when the lawn mower or tractor isn’t operated. It will start the engine even after 2 or 3 weeks. However, if it fails to start the mower after several days of none use, then you require a new battery. A cracked case will lead to spillage of the electrolyte. This will affect the way the battery stores power and also acts as a gateway for contaminants that will damage it eventually. Furthermore, the electrolyte or spill is corrosive and will damage the carrying case. If you notice that the lead-acid battery is always boiling when being used and the charging system is okay then its time you got a replacement. This signifies failing plates or over sulfating which affects charge storage. A quick way of confirming the affected cells is by using a multimeter to check the voltage in each cell beside physical examination. Another symptom of a failing battery is a bulging case which means the internal components are ruined. This usually affects maintenance free batteries which don’t require topping up with an electrolyte and instead have a gel. Battery terminals wear out over time. This is mostly caused by poor maintenance practices which include not cleaning them regularly or properly, poor fitting, or exposure to moist environments. If too corroded or worn out the terminals have a weak contact that will affect starting and performance of the lawn mower. After reading this review, owning a good battery for your lawn mower or tractor should be more comfortable. You just need to select the one that suits your needs and this entails knowing the engine capacity, recommended battery size, battery connectors/terminals, space in the mower, and obviously your budget. In picking the above pieces, we looked at their popularity, consumer reviews, manufacturer reputation, and expert opinions. You are thus assured of high quality and reliable unit. In addition to acquiring the best lawn mower battery and being able to maintain a good looking and healthy lawn, you will also enjoy maximum contentment.